Recombinant is a festival produced by Recombinant Media Labs (RML) who act as a producer and presenter of artworks and performances based on spatial media synthesis and its enveloping VR / AR / MR offspring. Recombinant brings back to San Francisco the CineChamber; a 10-screen wrap-around cinema experience, presenting seminal works from the RML archive alongside new projects by emerging artists-in-residence. The CineChamber is a large, but intimate, rectangular surround-screen apparatus, capable of scaling its 8 by 12 meter proportions to fit into auditoriums, theatres and concert halls around the globe. The platform offers extensive, immersive intermedia production opportunities and can be utilized by creators and innovators in a variety of ways – from co-active synesthesia to telegenic stagings, from realtime installation interactions with live music to programmed exhibition screenings. 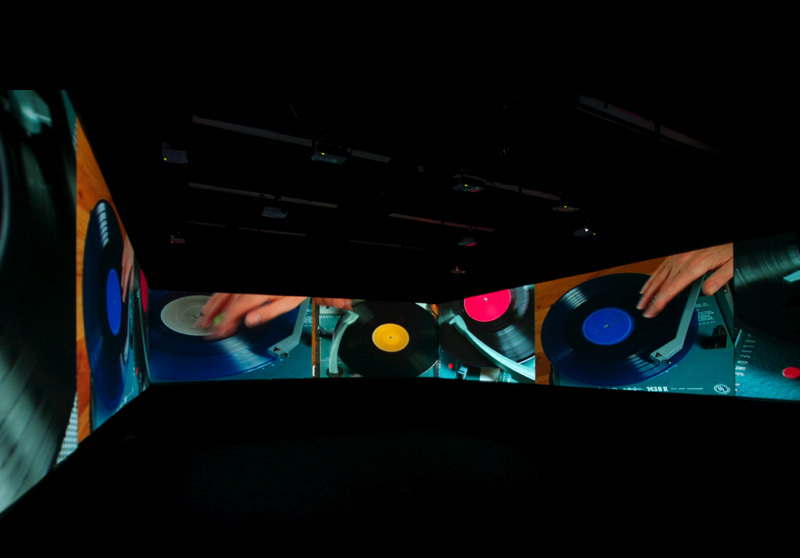 The CineChamber can be "played" or "manipulated" as an AV instrument and provides international artists the opportunity to take their creative impulse to the furthest frontiers of aural, optical and film collage languages. Previous international artists who have created modules or appeared at RML events include: Alva Noto and Blixa Bargeld, Ryoji Ikeda, Maryanne Amacher, Christian Fennesz, Biosphere, Ryoichi Kurokawa, Speedy J & Scott Pagano, Chris Watson, Thomas Brinkmann, Monolake, Pan Sonic, Poie, Matmos, Rrose Christian Marclay, and many more. Coming from a long line of Cineorama multiscreen experiments throughout the last century and earlier, one of RML's direct antecedents was patented in 1897, with Raoul Gromoin-Sanson's use of ten synchronized movie projectors in the round that was featured in a world exhibition. Since then, in Disneyland and IMAX, Osaka's Pepsi Pavilion, Lightshows, and various circle-vision configurations, the urge to submerse the spectator in an ocean of stimuli has been high. Now the CineChamber takes a perseverant place amongst this research and activity, as an evolutionary directive propagated from the ingenuity, inventiveness, and inspiration of these early revolutionary pioneers. RML was founded in 1991 by Naut Humon, and further evolved by technical directors Vance Galloway and Barry Threw, along with artists Edwin van der Heide, Egbert Mittelstadt, and Li Alin. Qualified support from Obscura Digital, UCSD, ICAS, Gray Area, and Goldsmith's University, London, has expanded the base. It continues to research the qualities and artistic potential of spatial envelopment by means of Experiential Engineering; exploring processes that expand the aesthetic and technological boundaries of panoramic installations, surround cinema, and multichannel AV performances. Recombinant Media Labs emerged from a series of experiments that started over two decades ago with the Sound Traffic Control tower of televisions amidst hundreds of speaker arrays in Tokyo's Ginza district. After a number of years of blending live vs. programmed events of symphonic scale and substance, RML and Asphodel, a bi-coastal independent record label, joined forces to occupy two fixed-location warehouses in the bay area in California to headquarter a performance-residency convergence center for developing their submersive, simulation style of re-cog-ignition. After working several years within downtown San Francisco, a new organization with a focus on mobile setups was founded. This was done in order to formulate an answer to the increasing requests for international presentations at museums and festivals. Freed from the constraints of a geographically anchored construction, RML’s nomadic approach is also able to offer residency opportunities together with various other organizations in international cities. This vanguard hybrid media platform encompasses many presentational options to potential partners, (co)-producers and curators. For those readers interested in interfacing, interning or contributing artworks to such a platform please contact us.